After scanning the negative, transparency or reflective object, or directly importing an image from a digital camera, it will be necessary to make the necessary digital imaging manipulations in Adobe Photoshop to optimize the the digital photographic image. 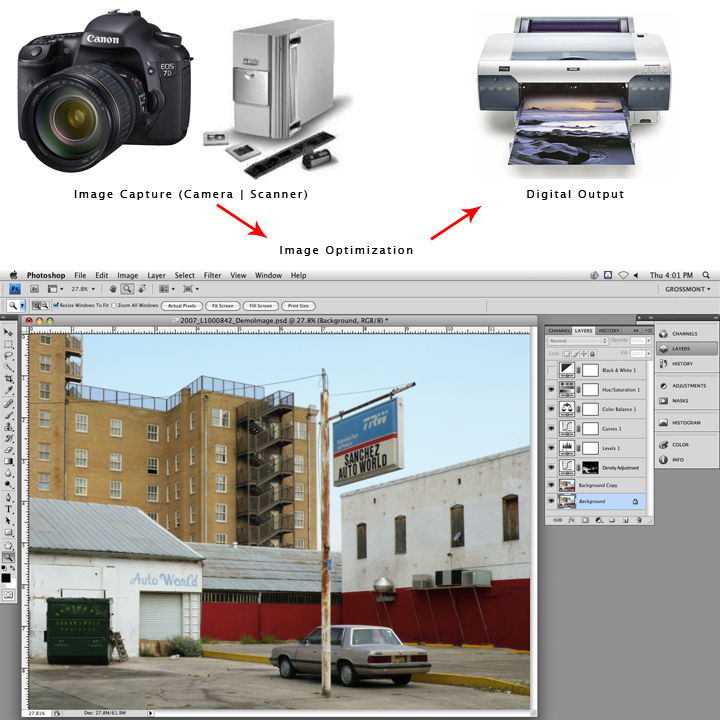 The process of basic image optimization includes cropping | sizing the image, making global image adjustments, including overall image density and contrast, color | grayscale tonal balance, and hue/saturation, as well as fine-tuning the image with local image adjustments, including density and contrast (burning and dodging) | color | grayscale tonal balance within specific areas of the image. Additional basic image optimization techniques include retouching dust marks and image imperfections, enhancing image sharpness and final file preparation for digital photographic output. The following provides a basic overview of Adobe Photoshop and guide to begin working with digital photographic images. 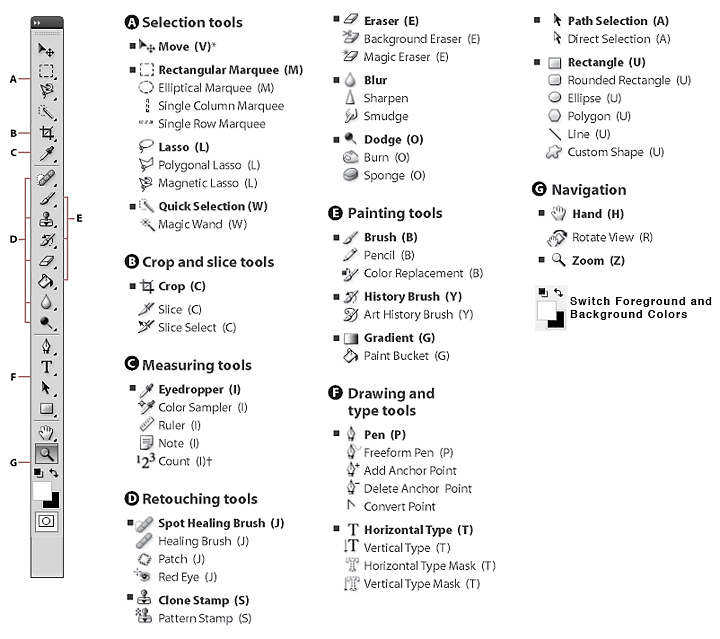 Prior to working in Adobe Photoshop, it is helpful to familiarize yourself with the Adobe Photoshop Workspace, including Menu Headings, Application Menu, Panels, Tools Menu and Tool Options Menu. Under Photoshop, there are options for customizing Photoshop preferences, including how the workspace will appear on the desktop as well as file handling options and Plug-In preferences. The File Command provides options for opening and saving files as well as Importing images into Photoshop via scanners, Automate functions such as Contact Sheet and Page | Printing Setup commands. The Edit Command provides options for navigating through image-editing actions, including Step Forward | Step Backward options, Transform options (scale | perspective | skew | distort | warp), and Color Settings and Assigning/Converting Profiles. The Image Command provides options for selecting the Image Mode (Grayscale, RGB, CMYK and Bit Depth per Channel) , Adjustments (Levels | overall density, Curves | overall density & contrast, Color Balance, Hue/Saturation, Black & White conversion, Channel Mixer, Shadows/Hightlights, and Variations for previewing various adjustments), Image Size, Canvas Size and Rotating Canvas. The Image Size refers to the size of the image while the Canvas Size refers to the size of the overall photograph, including the image and borders. The Layer Command provides options for selecting new layers including, Duplicate Layers, New Adjustment Layers, Changing Layer Content and Merging Layers and/or Flattening Image. The Select Command provides options for working with various selections and specific areas of the image as well as Quick Mask mode editing. The Filter Command provides options for image manipulations, including Image Sharpening and other image rendering options. The View Command provides options for how the image is viewed on the monitor, including Proof Setup and Proof Colors for “soft print proofing”, Zoom In and Zoom Out options, Screen Modes (Standard | Full Screen with Menu | Full Screen), Extras including Grids and Guides, and Rulers. 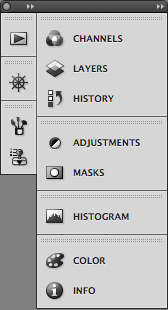 The Window Command provides options for viewing the various Panels with the Photoshop Workspace on the desktop, including Histogram, History (provides a list of the 20 previous actions), Layers, Adjustments, and Channels). These options can also be selected and located in a customized Panel Dock for ease of location and use to avoid clicking through the Window Command menu. The Help Command provides for searches | advice on using Photoshop. The Applications Menu provides shortcuts to work between Photoshop and Bridge as well as basic navigation functions and workspace | screen modes. The Panels Dock provides shortcuts to various workspace windows, including Layers, Adjustments, History and Navigation and can be customized with various workspace windows located under Window in the Photoshop Menu. The Tool Options Menu, located under the Menu Heading, is activated once a tool has been selected. The Tool Options Menu allows you to define the characteristics of the Tool highlighted in the Toolbox. Open Image in Adobe Photoshop. You may want to Save a Copy of the image to the desktop as a backup. Image Mode (if necessary). If working in color, insure that the image is in RGB mode. Click under Image, scroll down to Mode and click on RGB. Rotate Canvas (if necessary). Begin working with the image so that it is right reading. It may be necessary to rotate the image, (180 degrees, or 90 degrees clockwise/counter clockwise). To rotate image, Click under Image, scroll down to Rotate Canvas and make necessary rotation. Size | Crop Image. In the Tool Menu, click on the Crop Tool and crop the image to desired image size depending on whether the image has a vertical or horizontal orientation. To set the desired cropping size, go to the Crop Tool Options Menu and insert the appropriate dimensions as well as resolution. Use the mouse to control how the image is to be cropped. In utilizing the Image > Adjust > option, once the density, color balance, saturation level and/or black & white conversion has been adjusted, it is not possible to make further adjustments without causing image deterioration. In utilizing New Adjustment Layer > for Levels | Curves | Color Balance | Hue/Saturation | Black & White, you can go back to the specific Adjustment Layer and make additional adjustments without any image deterioration, though the file size will increase when saving the image with Adjustment Layers. 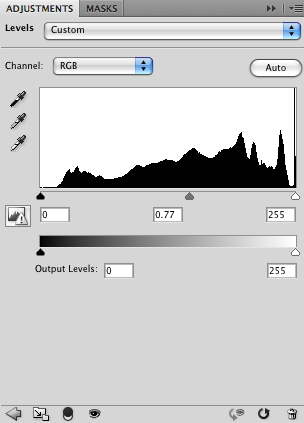 Levels are utilized to adjust overall density (brightness/darkness) in an image. Either using the sliders or the eyedroppers can set the dynamic range. Proceed to use the middle slider for overall desired tone. Use the eyedroppers to set the lightest and darkest areas of the image. In the Levels dialog box, hold down the option key and slide the white point slider. First areas to show will be the lightest areas. Release the slider where it is appropriate. Proceed to do the same with the black point slider and release where it is appropriate. The grey eyedropper is color correction tool. To further modify the white and black point settings, double-click the white eyedropper, which will open the color picker window and set HSB to 0/0/96 for the white point and 0/0/4 for the black point. In general, output devices have difficulty holding detail at 0% and 100% so backing off a little will preserve tonal information at the highest and lowest points of the image. Curves, which is similar to the characteristic curve with analog sensitometry, is used to adjust not only the overall density (brightness/darkness) of an image, but also contrast (difference between brightest and darkest areas), allowing for both global and local manipulation of tones. 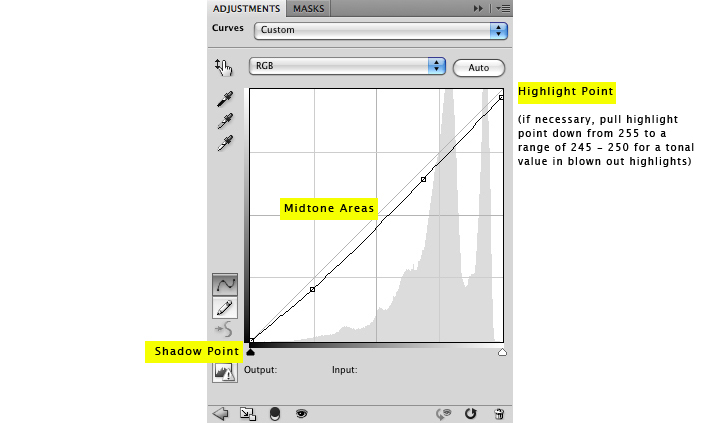 Begin by setting the highlights and shadows, and then adjust the shape of the curve to modify contrast. In order to maintain a “natural” look to the images, it is essential to keep the curve smooth while preserving the angle of ascent at all times. If a point to the right is lower than a point to the left, the image will begin to solarize. Color Balance is used to adjust the overall color of an image. When the Color Balance adjustment window is opened, three sliders will appear. The sliders are relative and work just like the subtractive color process with analog color printing. When cyan is removed, red is added and so forth with the other colors. 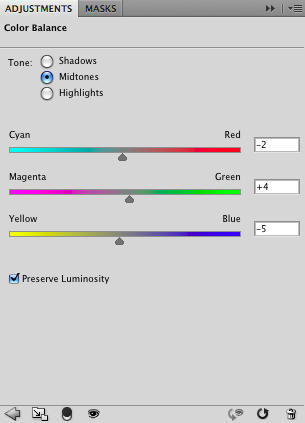 Each of the sliders can be used to affect color in the shadows, midtones and highlights of an image. Learning how to color balance is subjective and intuitive. Global changes in color can also be made with Levels or Curves and/or by using the different Channels (red, green and blue). 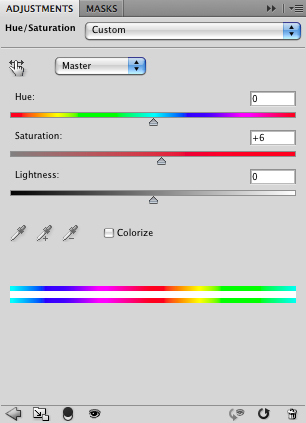 Hue/Saturation is used to transform color as well as affect the overall purity of a color. It is not used to correct color balance, but rather enhance the appearance of color. When selectively adjusting the saturation or hue of certain color ranges of an image, it is important to understand that this will affect the overall color balance and dynamic range of the image. Black & White provides for grayscale conversion of a color image as a separate adjustment, allowing for a single file to be used | printed as both color and grayscale. Sliders for individual color channels can be mixed for refined black and white tonal adjustments. In may be necessary to enhance the density in specific areas of your image. This can be accomplished with the Burn and Dodge Tools, which are located in the Tool Options bar or with separate Adjustment Layers and various masking techniques. Retouching with Clone Stamp Tool or Spot Healing Bruch as there will be scanning imperfections and dust marks in your image, it will be necessary to utilize the Cloning Tool, which is located in the Toolbox. Just like the Burning and Dodging Tools, you will need to select a Brush from the Tool Options bar. In addition, insure that the Mode is set at Normal, the Opacity is set at 100% and that the Aligned box is checked. 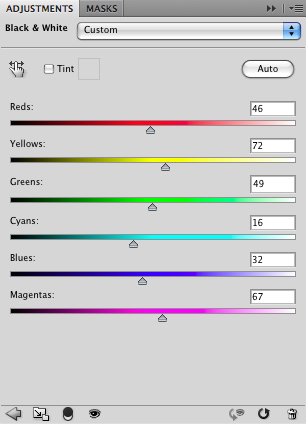 If you have utilized Adjustment Layers, it will be necessary to utilize the Cloning Tool on the Background Layer or preferably on a separate Duplicate Background Layer. To use the Cloning Tool, place the Cloning Tool in an area of similar tone that you want to duplicate. Hold the down the Option Key and click once with the mouse. The Cloning Tool is now activated to duplicate that tone. 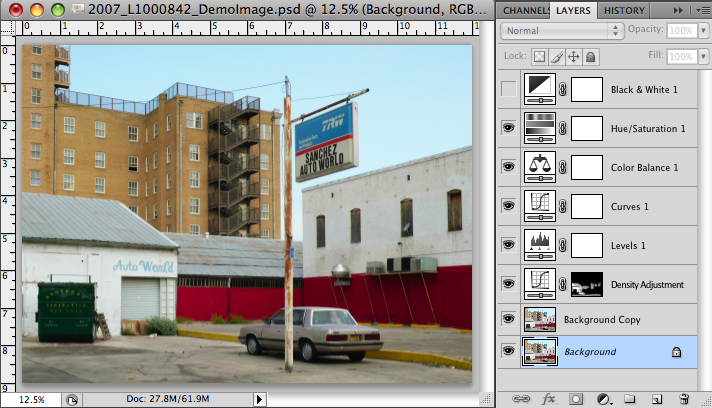 Move to the area of the image being retouched and click the mouse. The + symbol marks the area being duplicated.